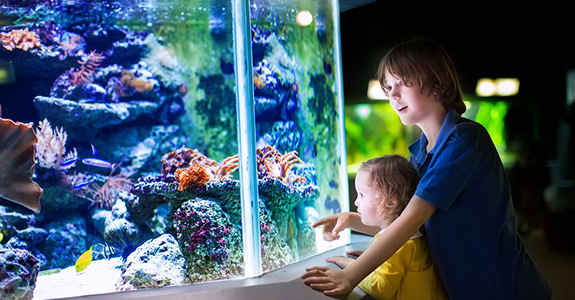 It’s important to keep custom fish tanks in Upper Saint Clair, PA looking crystal clear and beautiful with aquarium and pond maintenance from Aquatic Systems Consultants. In addition to maintenance, I’m also pleased to also offer aquarium and pond installation on a broad scope. As a Christian, I feel very strongly about treating customers the right way and always providing honest work. I offer daily or weekly maintenance with cleaning, feeding and water testing of fresh water ponds starting at 1000 gallons, as well as large marine salt water aquariums starting at 200 gallons. Salt water aquariums are my specialty! I deal with issues as they arise—everything from pump or pipe failure to tank cracks and anything else that might plague custom aquariums in Upper Saint Clair, PA. I also offer assistance in the relocation of aquariums from room to room or between homes or building structures. This entails capturing all resident animals in the tank or pond and holding them until the tank is drained, moving to the new location, and cleaning the gravel. Some of my designs for custom fish tanks in Upper Saint Clair, PA include various types of glass aquariums with special features, such as connected aquariums with tubes allowing the fish to swim between tanks, putting tanks directly into walls and other structures, and designing tanks together to look like acrylic fish. 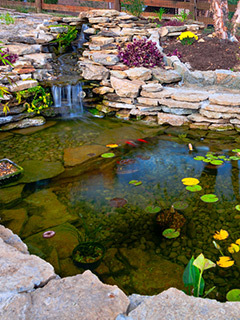 Small- to medium-sized ponds not only increase your home’s value, but also add a beautifully unique aesthetic to your property, creating a relaxing place for meditating and escaping the craziness of life. I can also incorporate waterfalls that wrap around the house, spray fountains, and koi or multi-colored fish visible at the surface for maximum effect. Depending on the size of the job, installations are performed by me and a crew of one to three people. We make sure there is room below the tank for a sump pump, then build the tank, install the decorations and fill the tank. This includes the pump, lighting and other necessary features. Any ecosystem with animals also has plants—they help to balance each other out. When a saltwater system is designed right with an algal scrubber system, you don’t even have to change the water! With ponds, we excavate the area to dig the hole in the ground before putting a pond liner down with rocks around the top to camouflage the liner. Water and fish are then added along with water features. If you’re looking for a unique and beautiful way to bring your home or business to life, start by adding life! Aquatic Systems Consultants is happy to consult with you about your vision for custom fish tanks in Upper Saint Clair, PA and bring that vision to life in a way that provides you with lasting enjoyment and value. Contact me today by calling 412-606-6012 to get started.